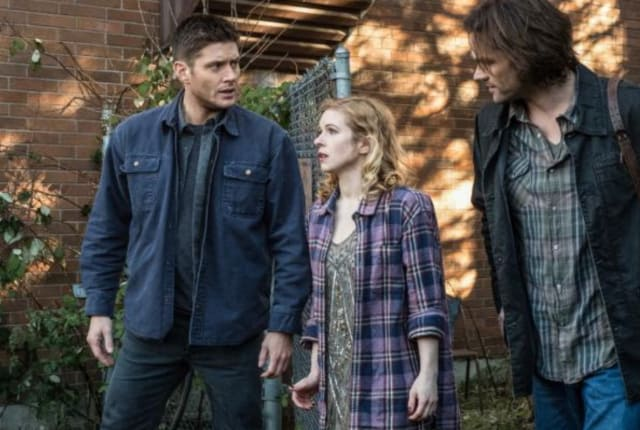 On Supernatural Season 13 Episode 17, Sam and Dean make an interesting discovery, but could things take a turn for the worse? Read on to find out! When you watch Supernatural Season 13 Episode 17 online you'll see just how far one monster will go to reunite with the other monster she loves. Sam and Dean are on the search for the final ingredient to the spell to get them to the other side. They discover what they need may be in a remote men of letters bunker in another state. The guys head there, but are surprised to find a woman, Sandy, who is shackled up in one of the locked rooms. The guys quickly unshackle her, and get her out in the fresh air. The guys quickly learn Sandy is actually close to 100 years old, and has been in the bunker since the 1920's. Sam, and Dean try to acclimate her to the world, but are quickly attacked at a diner nearby. Sam is kidnapped, and while Dean goes to look for him, the people who kidnapped Sam tell him they need to get the woman back because she's actually a god. Once she feeds, she will could quickly take out the entire world. Want to see what happens next to the guys? Go watch Supernatural online now via TV Fanatic to see the exciting conclusion. Jewel of the cosmos. What does that mean? Permalink: Jewel of the cosmos. What does that mean?